Few decorative pieces convey undisputed sophistication and wisdom the way that a world map does. The National Geographic Executive Political World Map Mural embodies this air of elegance and erudition effortlessly. Style and statement are the focus of many trends in today's decor and this beautifully crafted map makes it easy to eloquently bring out the boldness in your home or office. Grace your walls with this regal centerpiece that makes an excellent addition to rooms with subdued and neutral tones, as well as spaces with more vibrant palettes. This stunning, award-winning classic executive map of the world in an impressive mural sized masterpiece. Featuring Winkel Tripel Projection where each inch of space represents 206 miles, you can expect superior cartographic detail and accuracy paired with astounding artistry. Place this beautiful wanderlust inspiring map in your home or office as a truly distinct and elegant addition. This map can easily be affixed with three latex coated panels, which adhere just like wallpaper. For the perfect blend of intrigue and sophistication, the detailed imagery of a world map like the this one will especially make a charming addition to rooms with hardwood flooring or furnishings in gold or copper. If you seek ways to add a substantial statement piece to your living room, dining room, home office or bedroom, a world map is an excellent way to decorate your personal space with a one of a kind nostalgic backdrop that will leave a lasting impression in the most sophisticated of ways. As more designers embrace the concept of international themes throughout homes and offices, world maps are becoming more desirable for those who seek to add an exclusive spotlight piece to their personal space. For a stylish and breathtaking addition to your room, a mural-sized world map can completely redefine your room. With regard to flooring trends, brushed finishes give a natural and rustic feel to a home or space, which brings out elements such as ingrained textures. With a nod to nostalgic or period elements, this World Map Mural is a must have addition to your home or office and would pair perfectly with this up and coming style. More and more people are decorating their space with considerations from the ground up. 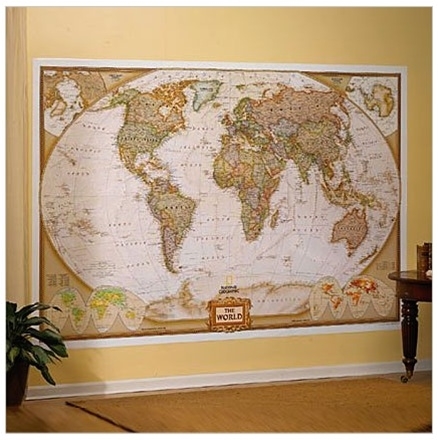 Draw together both your floor and surrounding space with the encompassing old-world elegance of this beautiful world map. Mixed patterns are another area that is trending in today's decor. Fully embracing busier elements in the home and office, a world map mural will be right at home as an enticing and accentuating piece, lending another element of versatility to your space. Also, with more emphasis being placed on textured furnishings, a National Geographic Executive Political World Map Mural adds creativity and vitality. Spring is almost here and with the change of seasons, its time to start considering redecorating. The National Geographic Classic Political Map Mural is a great way to incorporate international elements into your living space. Homes and offices are personal venues in which we spend plenty of time and express ourselves. In the workplace we need fresh ideas and creativity, a sense of purpose and direction. Interior design is very important as it sets the ambiance of a space. The world beholds much beauty and what better way to incorporate that truth into your home or office than with a beautifully crafted classic map mural? International elements in home and office design are trending and a mural sized map is a perfect way to encompass the uniqueness of wanderlust, while adding a colorful and well respected piece of art to your space. This versatile piece will blend well with either a fresh and vibrant room or easily become the energizing centerpiece to a more neutral space. What better way to express your appreciation of culture and exploration with this map mural. This world map offers not only aesthetic appeal but is an excellent reference guide. With a name like National Geographic you know this resource can be trusted to deliver accurate and useful information. Geographic accuracy meets an artist's detail with this finely cartographically designed piece. 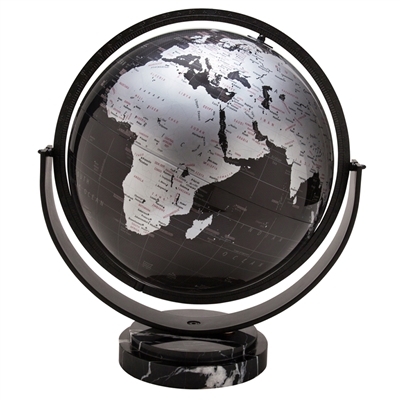 The world map offers Winkel Tripel Projection for a crisp image, with a ratio of 1 inch representing 206 miles. You can now add an award-winning classic map with extraordinary mural sized detail to your home or office. The USA edition map features stark blue oceans and colorfully textured landmasses for a truly pristine image in this mural-sized map. As with the world map, the USA map also offers cartographic design for accurate detail. Easily center both beautiful maps with three latex coated panels that allow them to adhere to your wall like wallpaper. If your hope is to exemplify the unique elegance while maintaining a symmetrically pleasing addition to your home or office, few will meet and exceed these expectations the way a mural-sized National Geographic map will. Mural maps are a beautiful and truly exceptional way to bring out an array of color palettes within a space. Due to the versatility of a world map, it can complement a space of vibrant colors, accentuating the various pops of color throughout. For more neutral or calmer colors, a world map can provide a warm and intelligent sense of aestheticism to your space. 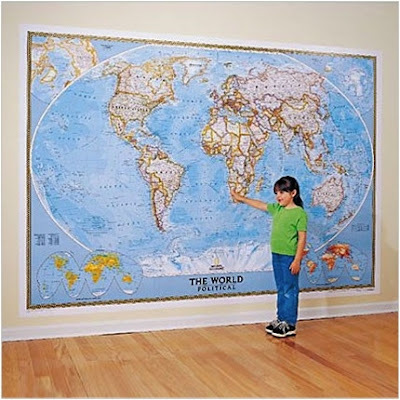 Excellent areas to place your map can be your living room, dining space, hallway, home office, or bedrooms. Few pieces of art are as functional, yet a visually pleasing display of a beautifully crafted and well placed world map. Recent trends indicate that richer darker floorboards are the rage. With more people choosing to adorn their space with bolder colors and moodier accessories, a mural map is a great way to add the right touch of vibrancy and versatility to your space. Tones such as grays alongside dark brown serve to give a warm and sophisticated feel to your home or office, while enhancing a sense of eloquence. A National Geographic Classic Political Map is the perfect way to decorate that sophisticated space in a unique and intelligent fashion.